For more information on the hardware “stars” and our special Electronica offer on all Eurocircuits hardware, see our newsletter of last week here . Visitors responded very positively to demonstrations of the data validation and DFM tools built into the Cost calculator menus. They can be used at any stage of the design process to optimise the design flow and avoid expensive and time-consuming re-spins. See our blog for a typical case-study. Positive reception too for built-in guidance on cost-effectivemultilayer builds and blind/buried vias. Another eye-opener: on-screen pre-order DRC validation to catch potential manufacturing issues in your data-set which might otherwise delay delivery. Marking Editor. Place order numbers, logos, QR codes and other batch information exactly where you want it on your PCB. Panel Editor. Create special delivery panels on screen to suit your PCB assemblers, without the need to make detailed drawings. BINDI pool: maximum order size now increased to 50 m2 for 2L boards. Electronica 2014 – the show . Pictures of the show. Electronica 2014 – the products. More information on the hardware and software products we demonstrated. What is order-pooling? How order-pooling helps to cut costs without jeopardising quality or delivery. How do we ensure the quality of your PCB – part 3? An introduction to microsection analysis. When should you put up your Christmas tree? Eurocircuits’/Elektor’s LED Christmas tree is back again. Program your own animation sequence and upload it. The best will be shown on our website. We have an on-going program of technical papers, but if there are particular topics on which you would like us to produce a blog or white paper, please email your usual sales contact or euro@eurocircuits.com. We are delighted to inform you that we have recently appointed Claudio Cardoso Guardao as Customer Support Engineer Spain and Portugal, working out of our headquarters in Mechelen, Belgium. We have a rapidly expanding number of customers in Spain and Portugal, and we were very fortunate to be able to add Claudio to our support team. He is a native speaker of Portuguese who is also fluent in Spanish, French and English. He joins us with three years’ experience of international customer support, based here in Belgium. He has already spent time in our factories in Germany and Hungary to learn how we make PCBs. If you check our online blogs, you will see that Claudio has started to translate recent technical blogs into both Spanish and Portuguese, for example on the new PCB PIXture tool. This is part of our drive to provide all our customers with easy access to the technical and online tools they need to bring their designs to market on time and on budget. You can contact Claudio via our online chat service, by email at claudio.guardao@eurocircuits.com or by phone on +32 15 28 16 38. 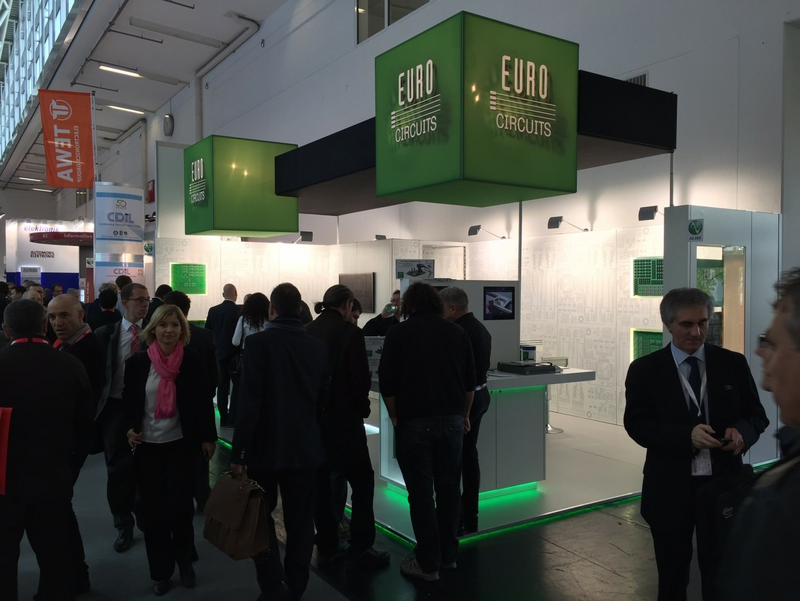 Electronica 2014 (11 – 14 November in Munich) was for Eurocircuits the busiest ever. Our booth team was kept busy from beginning to end presenting our newest products and services to existing customers and more than 700 new prospects. eC-pre-heater for faster and more reliable hand-soldering and de-soldering. 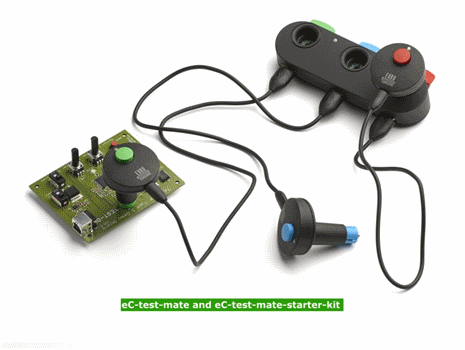 eC-test-mate – our award-winning fixtureless test system for populated PCBs. Both have been developed in response to our prototype PCB customers looking for high reliability test and assembly solutions at prices suitable for small batch operation. 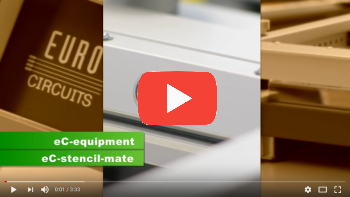 The eC-pre-heater has been developed to make manual soldering and de-soldering faster and more reliable by reducing heating times and the risk of thermal stress. This makes it particularly effective when soldering critical components or PCB layouts with a high heat-absorbency. The eC-pre-heater gives you complete control over the pre-heating process. Attach the external sensors to measure the actual temperature on the board, top and bottom, for maximum control of the process. Set the temperature that best suits this board or these components using the simple key-pad. When the display shows that the board has reached your chosen temperature, start soldering or de-soldering. The low profile, ergonomic design and insulated casing make the eC-pre-heater comfortable, convenient and safe to use. The eC-pre-heater is developed and produced by Eurocircuits and is now available for ordering. 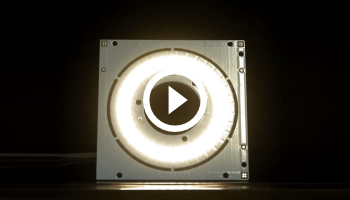 See our eC-pre-heater in action here. 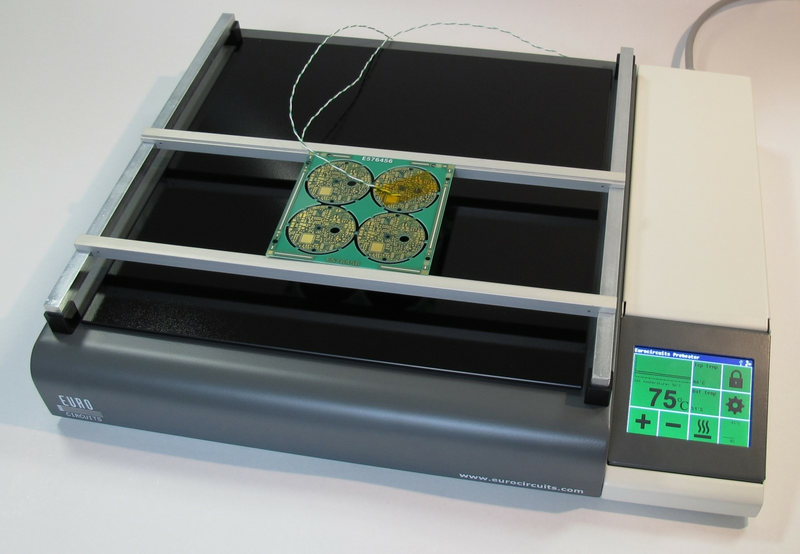 The eC-test-mate provides a cost-effective test solution for prototype and small-batch populated PCBs without losing the time and money needed to prepare test-fixtures. For many projects the cost/time needed for test-fixtures is prohibitive, making full programmed functional testing impossible. With eC-test-mate test or no test is no longer a question. eC-test-mate comprises a docking station and 3 ergonomic test-heads. Each test-head has 21 test-pins and integrated hardware for a specific range of tests: test-head T1 for general applications; T2 to test communication interfaces and T3 to provide additional measurement functions as needed. 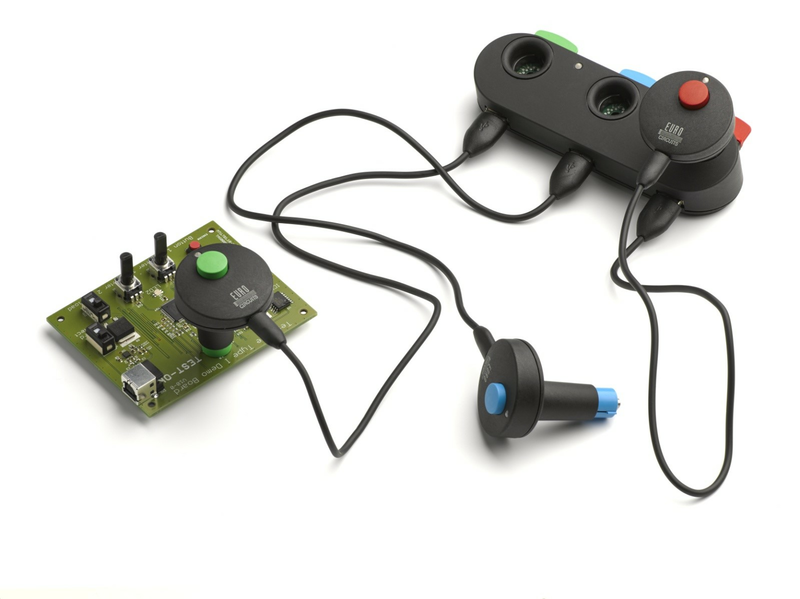 Combined they offer comprehensive functional testing for small-batch assembled PCBs. eC-test-mate is straightforward to use. Incorporate the test-head footprints into your design. If space is tight, the test-head-footprints can be placed on a snap-off coupon. Write your test program using eC-my-test software. Clear commands and structured menus make programming and debugging simple. Plug the test head into your PCB and run the test. To help you to start testing even faster, we also offer an optional Starter Kit which consists of a populated demo PCB and the corresponding test-scripts. For full information, manuals and footprint data for EAGLE and Altium CAD systems, click here. Watch the eC-test-mate movie here. 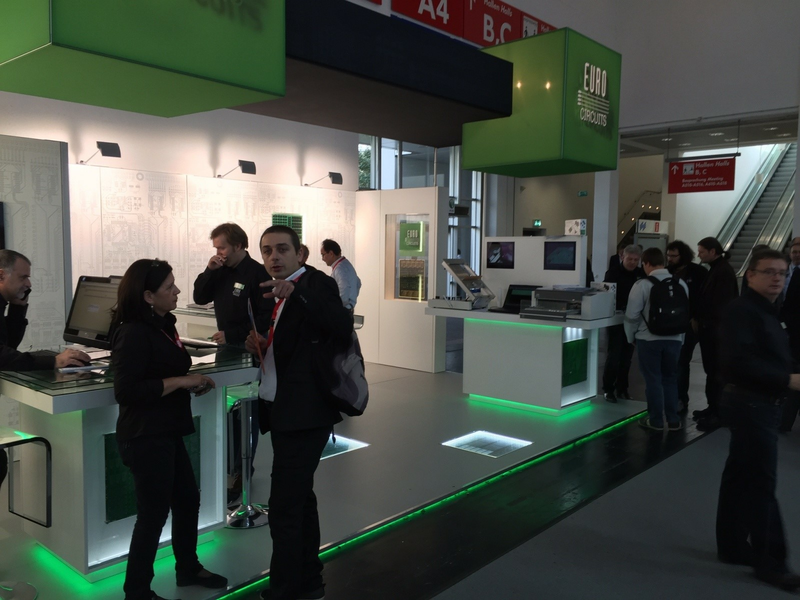 We marked Electronica 2014 with extensions to our PCB pooling services. Many visitors new to our services also responded enthusiastically to the range of tools available on the website to validate their data-set and tailor it for their current order. The extended services and new tools are all part of our ongoing strategy to offer electronics designers a single convenient location for all tools and services they need to bring their products to market on time and on budget. Smart menus – PCB Configurator. Visitors appreciated the data validation (Design for Manufacturability) tools build into our Cost Calculator menus, and the ability to run Design Rule Checks on the Gerber data and to view any potential manufacturing issues on screen thus avoiding any delays to delivery. A typical data validation scenario which rang bells with several of the designers was designing a board with 0.150 mm technology and then calling for 70 micron copper to handle heavy current. To ensure good etching and a reliable end-product 70 micron foil requires a minimum track/gap of 0.200/0.250 mm. Using the data validation in the Cost Calculator the designer can check this out early in the design cycle, minimizing the risk of a design re-spin. See our blog Optimum PCB Design Flow. Marking Editor. Designers welcomed the opportunity to place order numbers, logos, QR codes and other batch information exactly where they wanted them on their PCB. PCB PIXture. This new software package allows the designer to print a graphic image on his PCB as a black/white or gold image defined by the soldermask. There was considerable interest in this product at the show as designers felt that there is a strong trend to make visible more of the electronics in new products. PCB PIXture gives them the opportunity to make their designs stand out from the competition and to generate powerful messages to their customers. Panel Editor. In other cases designers needed to create special delivery panels to suit their PCB assemblers, whether in-house or sub-contractors. The Panel Editor allows them to do this online without the losing the time needed to make drawings. BINDI pool: maximum order size now increased to 50 m2 for 2L boards and 25 sq. m2 for 4L. 7 colleagues strong, the Eurocircuits team presented its new services and products to the large numbers of high class visitors who crowded onto the booth. This film gives a 1″30″ impression of the buzz at Electronica this year. We hope to see you there again in 2016, from 8 to 11 November. If you have any questions, click the Chat box on the right of the screen and chat with one of our experts. – details below. We have a special Electronica offer on all Eurocircuits hardware below. – more information in next week’s Eurocircuits Technical Update. eC-test-mate provides a cost-effective solution for testing prototype and small-batch populated PCBs without losing the time and money needed to prepare test-fixtures. It comprises a docking station and 3 ergonomic test-heads. Each test-head has 21 test-pins and integrated hardware for a specific range of tests. 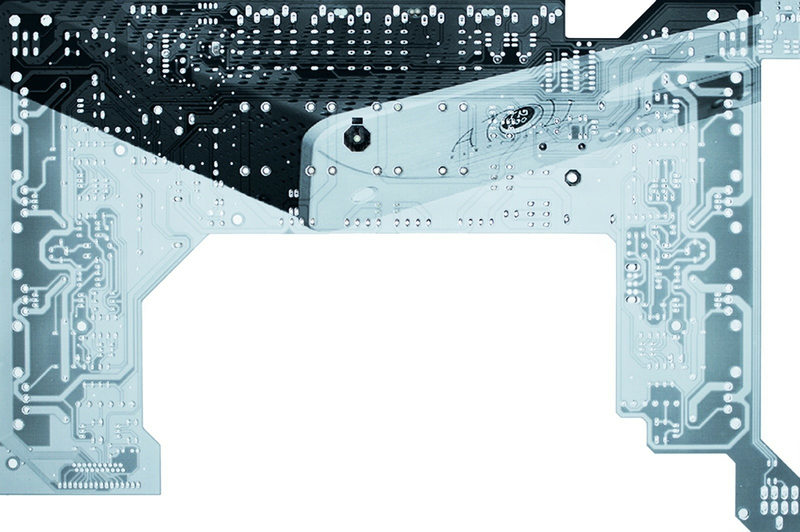 Combined they offer comprehensive functional testing for small-batch assembled PCBs. 2. Write your test program using eC-my-test software. Clear commands and structured menus make programming and debugging simple. 3. Plug the test head into your PCB and run the test. 4. Add the optional Starter Kit to start you testing even faster. Visit our website for full information or watch our movie here. eC-test-mate is available to order now. Use the eC-pre-heater to make hand-soldering and de-soldering of critical components smoother and more reliable. Load the PCB onto the eC-pre-heater. Connect the external sensors to the board for optimum precision. Various temperature profiles best suited for this PCB or these components, possible using the simple key-pad. eC-pre-heater’s slim-line profile, ergonomic design and insulated casing make it comfortable and convenient to use. Visit our website for more information or watch our movie here. eC-pre-heater is available to order now. Every customer placing an order for any of our machines: eC-stencil-mate, eC-reflow-mate, eC-pre-heater or eC-test-mate, between the 10th of November 2014 and the 1st of January 2015, will receive a 50€ (excl taxes) discount key valid for any of our PCB services. On top of that anyone ordering both eC-stencil-mate and eC-reflow-mate during the same period will receive a free eC-equipment-starter-kit. We have changed the presentation of our eC-consumables to put the most frequently ordered items at the front. Check them out under the Off the Shelf tab, and save money by buying PCB consumables in small batches suited to prototype assembly. PCB PIXture . Make your PCB stand out from the crowd with a visual image printed in the soldermask. How do we ensure the quality of your PCB – part 3 An introduction to micro section analysis. Optimum PCB Design Flow. How to get the best out of our DRC and Design for Manufacturability tools. This year”s Electronica was the 50th anniversary of one of the world”s largest electronics exhibitions. Over 73.000 visitors from over 80 countries were welcomed by 2.737 exhibitors from 50 countries. 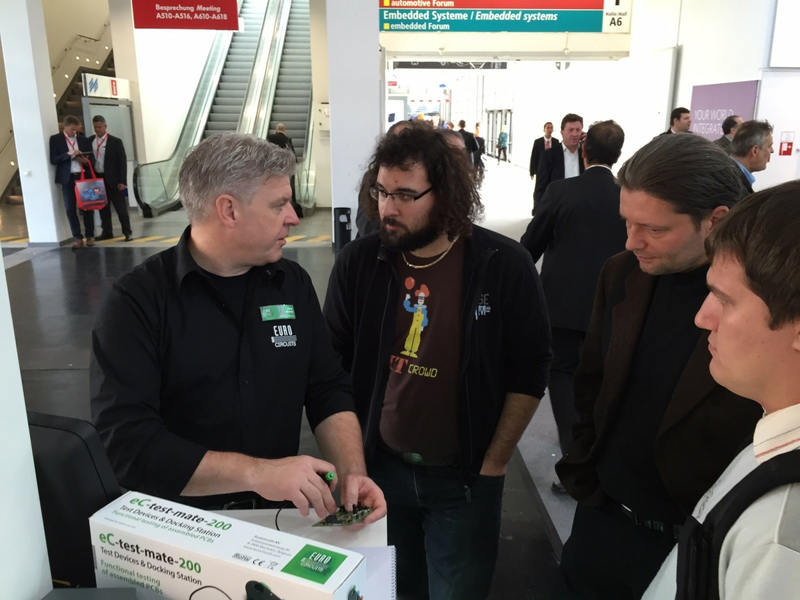 In the midst of all this, Hall A5 – booth 502, was Eurocircuits. See our video below. During the 4 days of the exhibition, our team welcomed over 700 new contacts and plenty of existing customers. Our products and services were well received by all our visitors. Our users told us how highly they value the service and support we offer them. 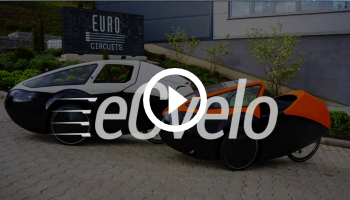 The response at the show gives us confidence that our ongoing strategy is right: to provide electronics designers in a single convenient location the tools and services they need to bring their design and products to the market in time and on budget. One of the highlights of the live demos of our PCB services was the appreciation of the way our smart menus can help designer achieve their optimum PCB design flow. See more of what we showed and explained at the show in our special BLOG. Furthermore we would like to share some moments of the exhibition with you in the following short film.